Macedonia’s president today (17 May) asked the opposition Social Democratic party to form a government, five months after an election in the troubled Balkan country. President Gjorge Ivanov handed the mandate to Social Democratic (SDSM) leader Zoran Zaev, who won the support of a parliamentary majority including ethnic Albanian parties. The president had earlier refused to grant the SDSM a mandate, saying national unity would be undermined by the demands of Albanian groups. 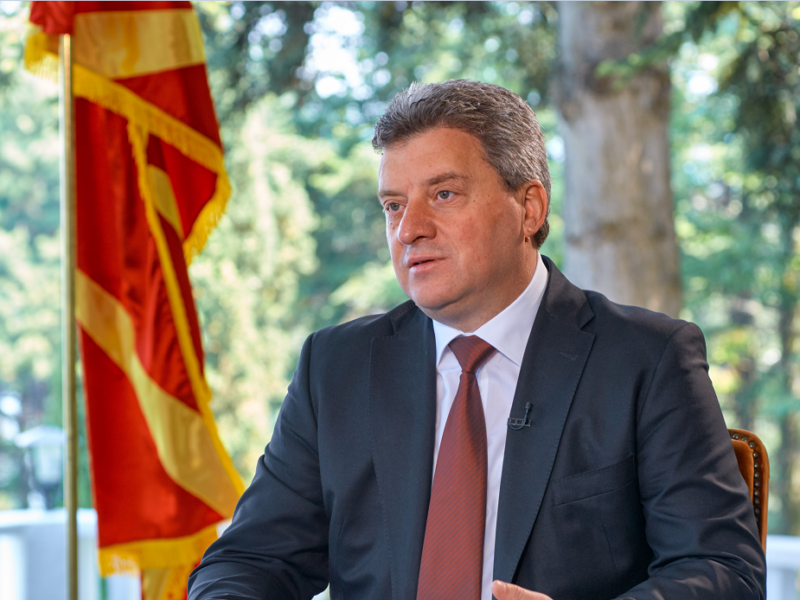 In a letter sent to Council President Donald Tusk ahead of the 9-10 March EU summit, Macedonian President Gjorge Ivanov warns against attempts by Western powers to impose on his country a political platform “written in Tirana”. But he came under international pressure to reverse his decision, particularly from the European Union, which Macedonia aspires to join. After a closed-door meeting with Zaev today, Ivanov told reporters that “the SDSM has secured a majority and I formally grant a mandate to the party with the parliamentary majority”. The move comes after two years of political turmoil in the country of around two million people, where violence erupted in parliament late last month. 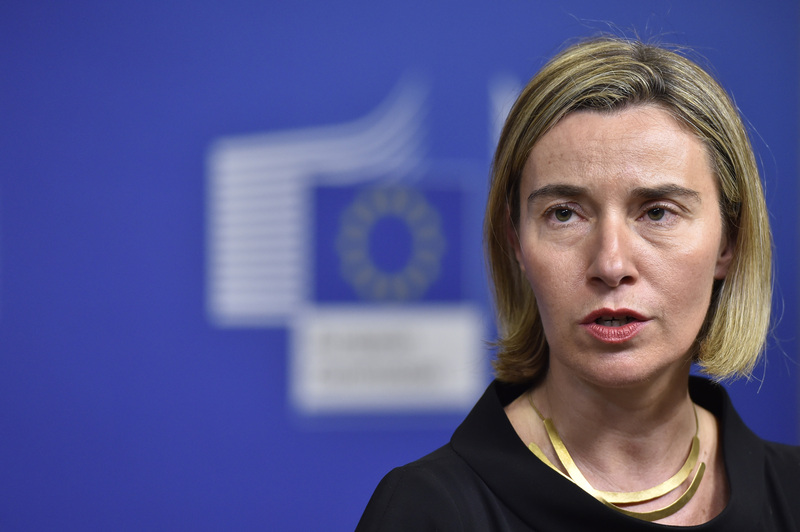 An EU statement welcomed the development and expressed hope that this “constructive spirit” would “continue to prevail so that the country can finally come out of the political crisis”. For a decade until last year, Macedonia was ruled by the conservative VMRO-DPMNE party of Nikola Gruevski, who is close to the president. In 2015, Gruevski’s nemesis Zaev began releasing tapes which appeared to show mass surveillance and top-level corruption under the VMRO, sparking huge street protests on both sides. Fourteen years since NATO pulled Macedonia from the brink of civil war, the ex-Yugoslav republic once hailed as a success-story of Western intervention is embroiled in a scandal that critics say has exposed its democracy as hollow, and could potentially reopen a dangerous ethnic divide. Gruevski stepped down ahead of an early election in December, but although his party narrowly won the most seats in the vote, he was unable to strike a deal with kingmaking Albanian groups. 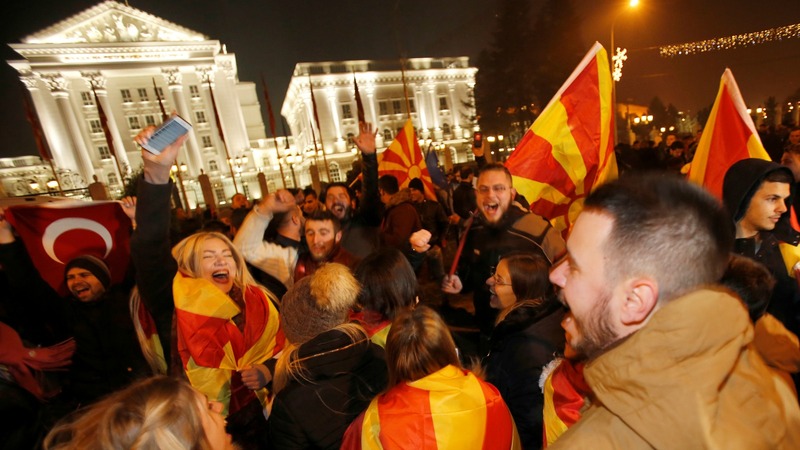 Macedonia’s nationalist VMRO-DPMNE and opposition Social Democrats were virtually tied in a Sunday (11 December) election aimed at ending a two-year-long crisis which brought down the previous government, state election commission preliminary results showed. The SDSM then won their support, but nationalist protesters took to the streets in opposition to the proposed coalition government. They were particularly opposed to the demand that Albanian be made an official language nationwide, fearing this could lead to the federalisation and eventual break-up of the country. Ethnic Albanians make up around a quarter of the country’s population. 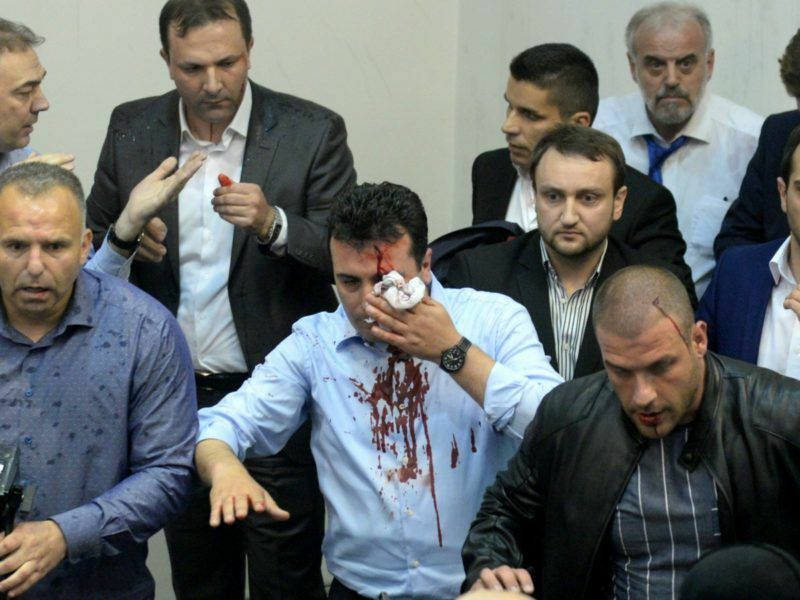 When the SDSM and its allies last month elected a new parliamentary speaker, ethnic Albanian Talat Xhaferi, protesters stormed the building in chaotic scenes and dozens of people were injured – including Zaev. Nationalists stormed Macedonia’s parliament on Thursday (27 April) and attacked MPs, including the opposition leader, in protest against a vote for a new parliamentary speaker. The SDSM and their allies accuse rivals VMRO of inciting the violence and fanning ethnic divisions in a bid to cling to power. Earlier this month, the EU played host to Xhaferi in a gesture of support for the opposition. The EU played host Thursday (4 May) to Macedonia’s new parliamentary speaker, ethnic Albanian Talat Xhaferi, in a gesture of support for the opposition as the unstable Balkan nation struggles to form a government. US deputy assistant secretary of state Hoyt Brian Yee also flew into Skopje soon after the violence for talks to help end the deadlock. On Wednesday, Zaev said he had provided written guarantees to the president, including pledges to protect the country’s unity and sovereignty. According to the constitution, he has a 20-day deadline to submit his programme and propose a government. 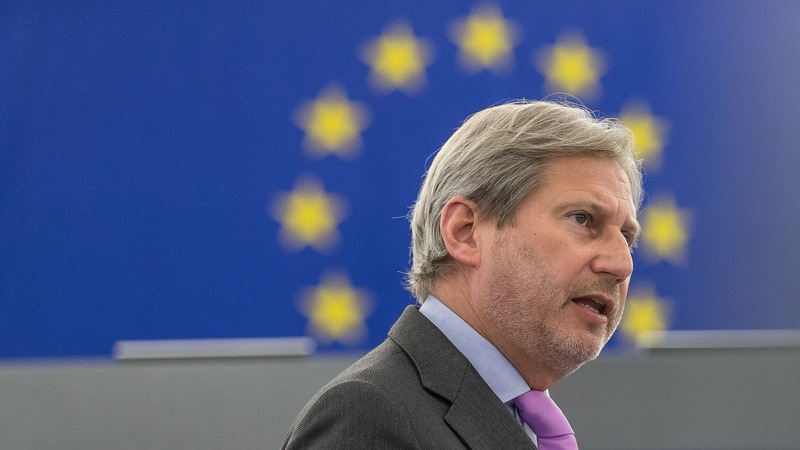 Neighbourhood Commissioner Johannes Hahn told MEPs today (4 May) that with recent violence in the Macedonian parliament he saw “the impossible”, and then added “but obviously everything is possible” in the country. the fact that Zaev and the Albanian parties have assumed power does not change the catastrophic cultural and political position that FYROM is in. Reversing the effects Antiquization will be difficult. Its reminiscent of Nazi Germany after the war. Gruevski ultra nationalist sympathies manifest themselves even among the more left wing of society. The damage has been done. 11 years of indoctrination and brainwashing have left their mark on the entire Slavic speaking population. 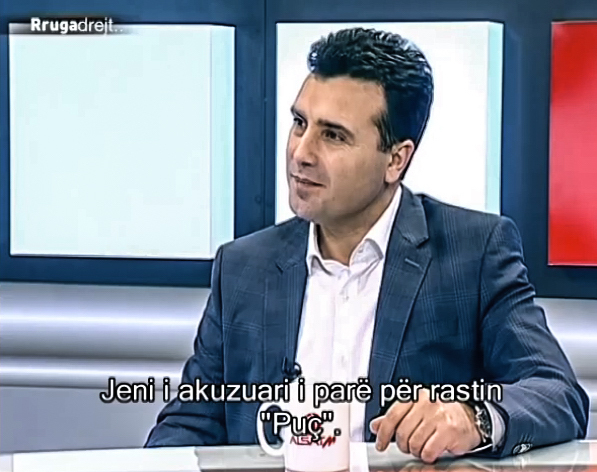 If Zaev even attempts to de antiquate FYROM he will face violence and terrorism. They will not give up their fabricated story easily. De Antiqization will result in name change. Name change will result in flag change. There will by a psychological earthquake among the Slavs. The Albanians will not be effected but the Slavs will see it as betrayal. It will be interesting to see how the next 12 months pan out. It’s become rather boring watching it play out since 1991. Ultra nationalist rhetoric and Antiquization vs Bulgarian-ism. The government must consult psychologists and historians in order to get this historically deranged nation back on track. As soon as the healing process has occurred they need to join Europe and become an inclusive society. The polarization of Slav and Albanian has permanently damaged FYROMS society. The changes need to be extreme. Renaming of airports. Renaming of football stadiums. Renaming of the country. Renaming of the highways. Removal of offensive statues. Changing the school curriculum. Change of flag. Embracing a dual language platform. So much to do. Its an enormous task for any government. The VMRO damage should have been addressed long ago. They let it fester for too long. The repair bill is now gigantic.